Parrots are highly social eaters -- they love to share a meal with human companions. Trouble is some foods eaten by humans are not good for parrots to eat. You cannot count on your parrot's natural instincts to guide his dietary choices. In the wild, parrots learn which foods are safe to eat from their flock mates. Most captive parrots do not have this advantage and rely on their human caretakers to make appropriate choices. Parrots can safely eat many fruits, but the ones they should avoid are highly toxic to them. Avocado tops the list of fruits parrots cannot safely eat. This fruit's pit and skin are the most toxic parts of the fruit to parrots. However, even its flesh is highly dangerous. As explained by Bird Channel, avocado persin acts as poison in a bird's digestive system. While some parrots have eaten avocado and guacamole with no incident, veterinarians advise against including it in your parrot's diet because for most birds, it is deadly. Rhubarb is another fruit you shouldn't feed a parrot. It contains oxalic acid -- another potentially poisonous substance for birds. The seeds and pits of apples, apricots, cherries, nectarines, peaches and plums are off limits as they contain a cyanide-like substance. 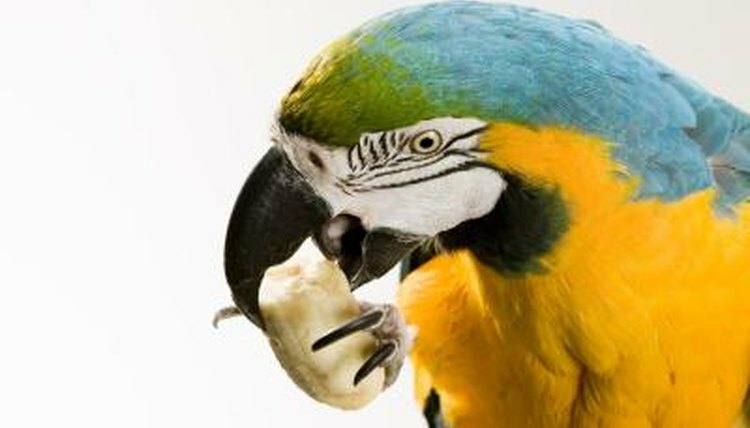 Many fruits are not only safe but encouraged in a parrot's daily diet. Fresh fruit offers birds many nutritional benefits. Safe fruits that are also often included in parrot pellet mixes according to Avian Web are apple, apricot, banana, cranberry, mango, nectarine, orange, papaya, peach, pear and pineapple. Onions -- either cooked, raw or dehydrated -- contain sulfur compounds that can cause red blood cells to rupture and lead to anemia. Garlic, cabbage, kale and mushrooms can give some parrots an upset stomach. The stems and caps of mushrooms contain amatoxin. It causes liver failure. Celery isn't necessarily harmful for parrots. Just remove the stringy section that can cause bowel blockages. Fresh tomatoes are high in acid that causes ulcers. Sharing a drink with your parrot is an effective way to bond. Select an appropriate beverage such as water or fruit juice that does not have added sugar. As with other animal companions, drinks such as coffee or other caffeinated beverages, alcohol and carbonated concoctions are harmful to parrots. It isn't a "sweet" idea to share chocolate with your parrot. Chocolate is made by roasting the seeds of the theobroma cacao plant. Theobromine -- a bitter alkaloid with an incredibly slow metabolism rate often leading poisonous saturation levels in animals -- is one of the byproducts of this process that is contained in chocolate. It speeds up metabolism to dangerous levels. Chocolate also contains caffeine, which is a methylxanthine. In animals -- including birds -- its effects on the central nervous cause hyperactivity, excessive thirst, abnormal heart rhythm, tremors, seizure and even death. Amy M. Armstrong is a former community news journalist with more than 15 years of experience writing features and covering school districts. She has received more than 40 awards for excellence in journalism and photography. She holds a Bachelor of Arts in communications from Washington State University. Armstrong grew up on a dairy farm in western Washington and wrote agricultural news while in college. What People Food Can an Orange-Winged Parrot Eat? Is Cooked Onion Toxic to Your Pet Bird? What Human Foods Can Finches Eat That Are Healthy for Them? What Is a Good Snack for an African Grey?